St Pete Beach Hog Wild! Happy New Year everybody. So far this has been a crazy winter. Not only has it been one of busiest winters ever the fishing has been pretty solid as well. Fishing inshore the sea trout bite is pretty consistent in 4 feet of water. Fishing the residential canals there has been plenty of redfish and sheepshead to keep us busy as well. While that fishing is fun, its nice to mix it up every now then and do something different. So instead of 4 feet of water, how about 40 feet. When the weather has permitted I’ve been taking my charters about 10 miles offshore of St Pete Beach to do some bottom fishing. 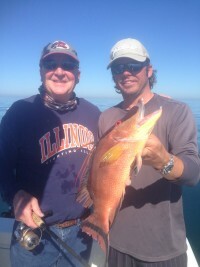 The action has been non stop with grouper, snapper, key west grunts and the best of all hogfish. Most of the time you hear of divers spearing hogfish, but they can be caught on hook and line as well. Using the same light spinning gear we use inshore my charters have been having a blast out there reeling in fish after fish. 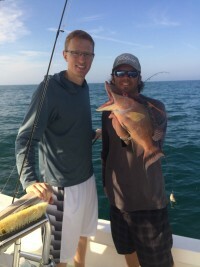 Not only are the hogfish a great sport and make for a nice picture, they are the best eating fish there is. They only eat shrimp and small crabs, which makes their meat very sweet and a nice texture.